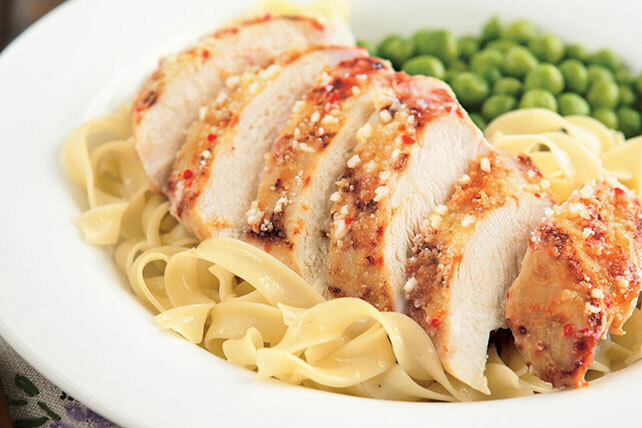 A zesty Parmesan sauce marinates the chicken, making the ordinary extraordinary! Mix dressing and cheese; pour over chicken in shallow dish. Turn chicken over to evenly coat both sides of each breast. Refrigerate 30 min. to marinate, turning chicken over after 15 min. Heat oven to 425ºF. Remove chicken from marinade; discard marinade. Place chicken on foil-covered baking sheet. Bake 20 min. or until done (165ºF). Pour dressing mixture over chicken in resealable plastic bag; seal bag. Freeze up to 3 months. (Chicken will marinate in freezer.) Remove chicken from bag; discard bag and marinade. Place frozen chicken on foil-covered baking sheet. Bake at 350ºF for 1 hour or until chicken is done (165ºF). Or to cut the baking time in half, thaw the bagged chicken in the refrigerator before baking. Serve with buttered hot cooked egg noodles and your family's favorite green vegetable. Prepare as directed, using KRAFT Asian Toasted Sesame Dressing and substituting 1 Tbsp. toasted sesame seed for the Parmesan cheese.